Today’s comic is early because we’ll be in LA for the remainder of the week for E3! Not too much to comment on with this spiritual successor to the Dragoon comic so long ago. More silliness with SSB items! The final panel was actually a late addition that I enjoyed enough to keep. 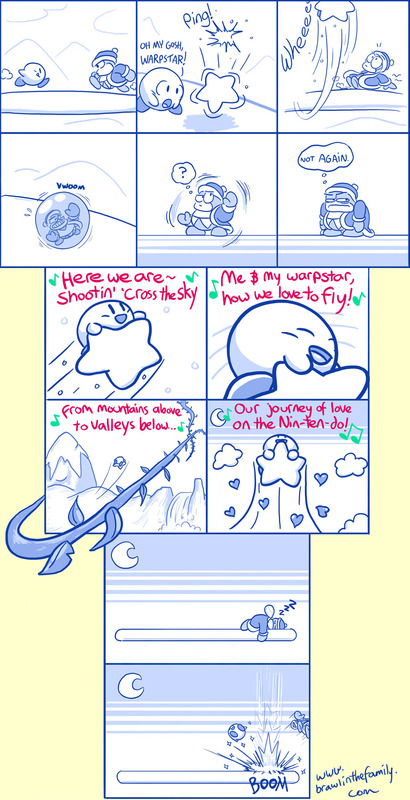 I did want to imply that the entirety of Kirby Air Ride occurred during his trip as well (see the ninth panel and its mysterious sky vines, etc). Okay, so it’s game time! I’ll be coming back early on Friday, so the next comic may be a little late, but here’s hoping for some major reveals this E3. I’m definitely eager to hear about their newest system, which is rumored to be playable. Expect some major impressions from us soon!